Replica carmakers take notice: Daimler will not tolerate copies of its signature Mercedes-Benz 300 SL. At all. And if you fail to head this warning and build a full-size replica of a 300 SL gullwing, justice will come down like three tons of bricks upon your unlicensed creation. 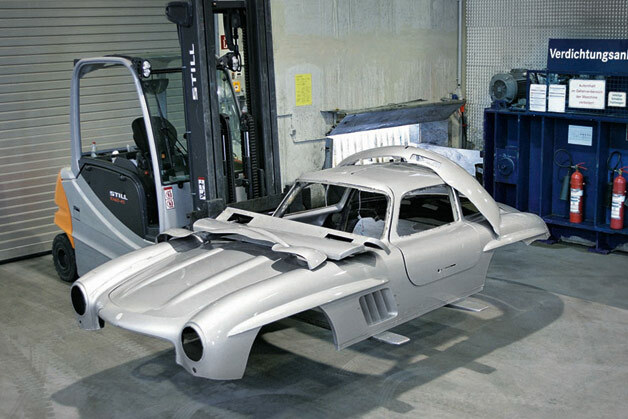 German customs officials recently confiscated what looks to be a very faithful reproduction of a 300 SL from a German company, albeit rendered in fiberglass, and they apparently notified the folks at Daimler, who didn't take too kindly to the unauthorized likeness of their icon. In their press release (available after the jump), Daimler says the body of the 300 SL is a "work of applied art" that has been under copyright protection for decades. And to make clear their intent to protect that copyright they also remind us they have "long taken a tough approach to vehicle replicas." Daimler crushes unauthorized Mercedes-Benz 300 SL body originally appeared on Autoblog on Thu, 22 Mar 2012 11:00:00 EST. Please see our terms for use of feeds. ...how am I ever gonna make a buck? I recently bought some shares of Daimler. Glad to see they're protecting my investment . . . I didn't realize they did not allow reproductions of older cars like this. Aren't there reproductions or kit cars of ones like the 500K?